BANGKOK: Six senior monks including well-known activist monk Phra Buddha Isara have been defrocked after they were denied bail in court, resulting in them being sent to jail following their arrests yesterday (May 24). Some 200 police commandos made coordinated raids on temples and arrested senior monks for alleged embezzlement, including members of the Sangha Supreme Council, as well as Phra Buddha Isara. At Wat Or Noi in Nakhon Pathom’s Kamphaeng Saen district, police arrested abbot Phra Buddha Isara, who gained notoriety for his support of the Bangkok Shutdown movement in 2013-14, led by the then People’s Democratic Reform Committee (PDRC) seeking to oust the Pheu Thai Party-led administration at the time. He is the subject of an arrest warrant issued by the Criminal Court on charges of ang-yee (running an illegal secret organisation), and forging royal names. The case against Phra Buddha Isara relates to a group of anti-Yingluck Shinawatra government demonstrators he led which robbed Special Branch police of guns during their protest on Feb 10, 2014. The case also involves using the initials of the names of the late King Rama IX and Her Majesty the Queen of the late King on the back of Buddhist amulets without royal permission. Investigators took the monk to the Criminal Court to seek approval for an initial 12-day period of detention. Police opposed bail. After the court approved the detention request, the National Office of Buddhism (OB) asked three monks from Wat Samiannaree to perform the defrocking of the monk at the court. 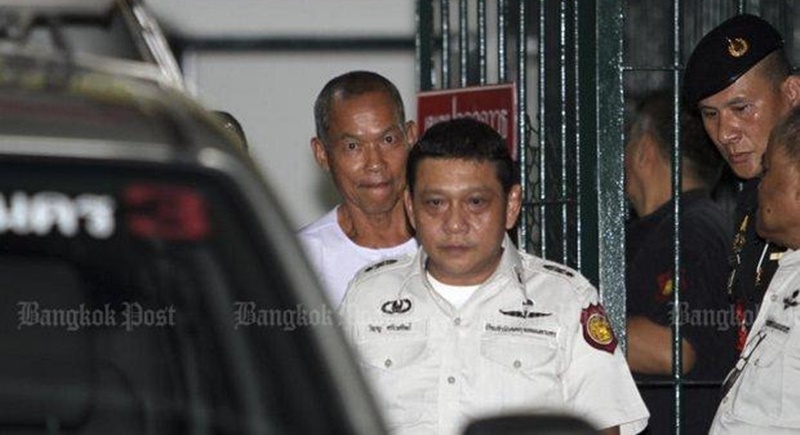 After leaving the monkhood, the 59-year-old former monk, who is now known as Suwit Thongprasert, dressed in white, was escorted to the Bangkok Special Remand prison where he will be detained. Monks who are sent to jail have to leave their monkhood first. Devotees said that they intend to apply for bail for the former monk today (May 25). Forces from the Crime Suppression Division (CSD) had search and arrest warrants for the 6am raids at Wat Sam Phraya, Wat Sa Ket and Wat Samphanthawong in Bangkok, and Wat Or Noi in Nakhon Pathom. CSD police took five senior monks arrested in Bangkok to the Central Criminal Court for Corruption and Misconduct Cases to seek an 12-day initial period of detention. Police opposed bail. The court approved police’s request. They were also taken to the Bangkok Special Remand prison. Among the five arrested monks are Phra Phrom Dilok, the abbot of Wat Sam Phraya in Bangkok, and his secretary, Phra Atthakit Sophon. They were charged with temple fund embezzlement. Phra Phrom Dilok is also a member of the Sangha Supreme Council and the ecclesiastical governor of Bangkok. Phra Atthakit is secretary to the ecclesiastical governor of Bangkok. The other three arrested monks are Phra Sri Khunaporn and Phra Wichit Thammaporn, and Phra Khru Siriwihankansomjit, assistant abbots of Wat Sa Ket. Four laymen were also apprehended. They are Nuchara Sitthinok, Kimkamporn Niponpittaya, Thirapon and Tawit Sangyu, a 42-year-old official of Wat Saket. The monks and the laymen were charged with embezzling funds for a Buddhism school project and money laundering. Phra Phrom Sitthi, abbot of Wat Sa Ket, and Phra Phrom Methee, assistant abbot of Wat Samphanthawong, were still being sought. They were wanted on charges of embezzlement of temple funds. Phra Phrom Sitthi and Phra Phrom Methee are also members of the Sangha Supreme Council. Phra Phrom Sitthi is also the 10th ecclesiastical region governor. Phra Phrom Methee is also the governor of the 4th-7th ecclesiastical regions. According to a report from the National Office of Buddhism, His Holiness the Supreme Patriarch has dismissed Phra Phrom Sitthi, Phra Phrom Methee and Phra Phrom Dilok as members of the Sangha Supreme Council (SSC). The SSC will meet on May 30 to consider whether to remove them from the governing posts in the clergy which requires a resolution from the meeting. Temple staff said they last saw Phra Phrom Sitthi, Wat Sa Ket’s abbot, about 4pm on Wednesday (May 23) when he told them he would inspect construction work in the temple’s compound. Police were surprised to find a secret exit from the temple to Bamrung Muang Rd, as detectives had not seen it before. Immigration Bureau chief Lt Gen Sutthipong Wongpin said yesterday that the immigration bureau has now blacklisted Phra Phrom Sitthi and immigration checkpoints have been instructed to keep an eye out and prevent him from leaving the country. Arrest warrants were issued for four monks at Wat Sa Ket – abbot Phra Phrom Sitthi and assistant abbots Phra Sri Khunaporn, Phra Wichit Thammaporn, and Phra Khru Siriwihankansomjit, who was later arrested at Samitivej Hospital in the Sukhumvit area. Police suspect certain monks at Wat Sa Ket of embezzling money from two Buddhism-related projects worth B69 million. Money was transferred to outside people. Police said the abbot had 10 bank accounts and about B130mn had passed through them. All funds in the accounts were frozen. Rotten to the core. Unfortunately it goes deeper than that. My girlfriend told her ageing mother is reaching the end of her life. But for a fee, they can do some mumbo jumbo and decree that she still has years left in her. How many years, with knowledge of Authorities, these criminals were under the flag of monkhood handling their criminal activities? A monk, devoting his life to Lord Buddha, can not be rich, can not bribe people, have a private plane, foreign bank accounts, or like that monk of the flying saucer association ( I can't see it as Buddhist temple) or disappear with help only of bribing Officials.